Order matters how? | Write about what? 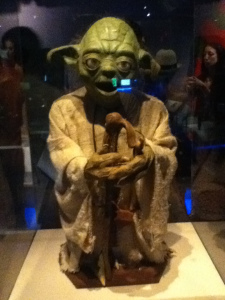 So what does Yoda have to do with creating the writer’s voice? While diction determines word choice, syntax determines where the words are placed. Language without syntax are words strung together with no method to the madness–in other words, nonsense. Our normal syntax mimics what we have heard before. Unique syntax requires mixing up that order without creating nonsense. Do you recall Yoda’s distinctive style of speaking in the Star Wars movie series? Simply take the predicate object or predicate adjective at the end of a sentence and move it to the front. Voila–Yoda speak. “But what is a predicate object and predicate adjective?” you ask mystified. Basically it is everything in a normal syntax that follows after the verb.